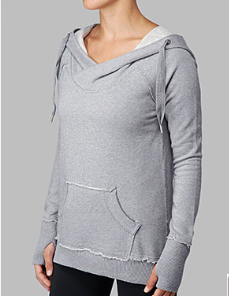 It’s not bad, but if your going for that style of oversized pullover hoodie I much prefer the Flashback Pullover. Not a fan of this hoodie at all. Too sloppy looking. I already ordered the brisk run ear warmer, so excited!! The arm warmers are super cute too, but I didn't order them. there are arm warmers?!? i need more! i have a pair in black and another in senorita pink and LOVE them. i have muscle aches in the cold and wear these casually in the house too… they are wonderful. And what about the vest? Was hoping that would be there today too…. I may just wait before ordering anything. Have plans to actually make a special trip to Halifax next week just to go to Lulu, so I think I will wait to place my order. Ugh NO INSPIRE!!!!! buttttt…. My lolo scuba hoodie was uploaded!! Jumped on that right away! So ticked about no inspire. Feels like we have been waiting forever and lulu is teasing us! Want the earwarmers, but I guess those can wait. I love this — especially in the lolo! I've never used arm warmers so I'm not getting those but the ear warmer…if I get my Inspire pullover today that's going in the cart too. I like that the ear warmer looks like a headband…. it's pretty ridiculous that cold weather items like the toque and ear warmer are out but not the pullover. i was going to order a few items but i'm not going to if there is no pullover. I can get what I need in store another day. i was just thinking this was the suckiest upload ever except for the fact that the Lolo Scuba was uploaded and the Ivy fast in flight bag. Nothing for me though except the ear warmers and those will wait until the pullover arrives.